Aid Year Schedules let you schedule disbursements for all aid awards in upcoming academic terms. This lets you avoid having to schedule disbursements for each student's individual awards. You create a 2018-2019 schedule for Pell Grants that disburses 50% of the award on August 15, 2019 and 50% on January 9, 2020 (these two dates are within three days of the start of your Fall and Spring Terms, respectively). A student accepts a $2,000 Pell Grant. Populi automatically schedules two disbursements for that student: $1,000 on August 15, 2019 and $1,000 on January 9, 2020. When you originate the award with COD, this information is automatically included in the origination data. For U.S. schools, the Federal Aid Year runs from July 1 to June 30. We have hard-coded this into how Populi handles financial aid. 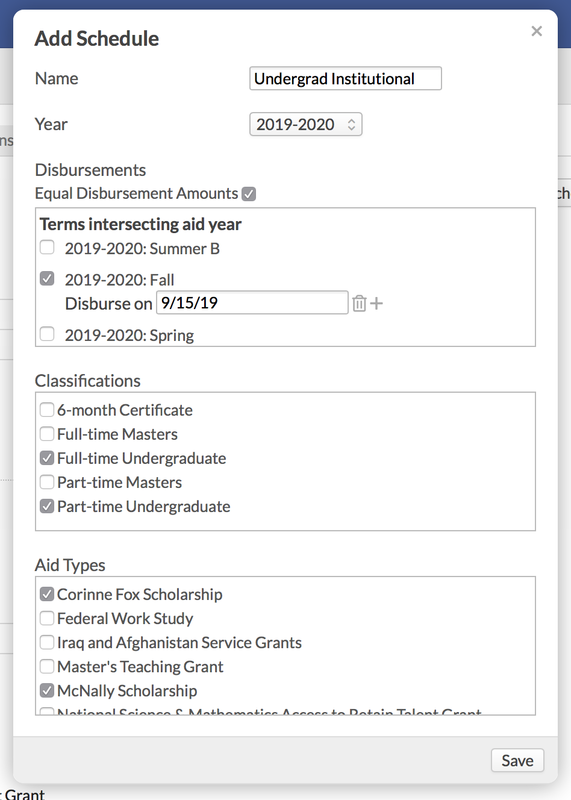 If a student applies for the 2020-2021 aid year, he's applying for aid that he'd get between July 1, 2020 to June 30, 2021. For Canadian schools, we can set up custom aid years if so desired. Give the schedule a name. Select an aid year from the drop-down. Check the terms you wish to include in this schedule. These terms are those whose start and/or end dates fall within the aid year. So, for 2018-2019, you can choose from terms that start or end between July 1, 2018 and June 30, 2019. Consult the Federal Student Aid Handbook and any applicable state/province aid regulations when setting up disbursements for government-sourced awards. When you check a term, enter the percentage of the total award amount you wish to disburse. Enter the date on which you wish to disburse the aid to your students. You can also simply check Equal Disbursement Amounts to evenly divide awards across the disbursement dates you enter. Click / to add or remove a disbursement date. Check the classifications and award types you wish to include in this schedule. When you add any of the award types included in the Schedule to a student, the Schedule will automatically add a series of pending aid disbursements to the student's account. These can be viewed (and individually edited) on the student's Profile > Financial Aid view. Next: If you are using the DOE integration features, fill in those settings. If not, get acquainted with Financial Aid workflows, reports, and functions.